Noticeably absent from the game are scout planes. In R.K. Lochner’s book The Last Gentleman of War: The Raider Exploits of the Cruiser Emden, it is noted that much reliance was placed on Emden’s scout planes for locating enemy merchant shipping in the disconsolate vastness of the open sea. . . . Lochner’s book also discussed how difficult it was to maintain the scout planes and the plane was easily knocked out of action due to mechanical failures. There’s a problem with that passage beyond the shockingly poor editing: In neither the English or German editions does Lochner write any such thing. The verification for the claim is just plain made up. Lochner makes no such statement for a very simple reason. Neither Emden nor any other German cruiser at that time carried an airplane. When one questions others’ work it’s usually a good idea to have one’s own facts in order, or an actual editor who'll check them. No German cruiser carried a seaplane into action until 1918, when the converted light cruiser Stuttgart sortied with the High Seas Fleet. She appears in our Great War at Sea: Jutland both as a standard light cruiser and as a seaplane carrier. During the Battle of Jutland in June 1916, the British had used seaplanes launched from a converted merchant ship to look for the German fleet. The Germans had used their rigid airships, but with much less effectiveness. The fleet command attempted to use its own converted merchant ships as seaplane carriers during the Moon Sound operation in the Baltic in October 1917. They found them much too slow to operate with the fleet, and the German carriers ended up serving as static depot ships in German-controlled ports. While these had their uses, the High Seas Fleet wanted seaplanes to hunt mines — a task which zeppelins did not perform well. In December 1917, the High Seas Fleet commander, Adm. Reinhard Scheer, sent a formal request to the Imperial Naval Office to convert at least one light cruiser for use as a seaplane carrier. The ship should be fast enough to operate with the fleet on sorties into the North Sea, and have the endurance to remain at sea and support the minesweeping and minelaying flotillas in the Helgoland Bight with aerial spotting. While Scheer recommended using the fleet’s older cruisers, the Naval Office studied a range of vessels including the 52,000-ton liner Imperator. The architects objected to using light cruisers as installing the required equipment would so greatly reduce the ship’s firepower as to make her useless in the cruiser role. Growing worried that the project might become entangled in bureaucratic wrangling, Scheer repeated the request at the end of the month, emphasizing its urgency. In late January 1918, the Naval Office authorized converting two cruisers, Stuttgart and Stettin. Stuttgart as converted to carry seaplanes. The only survivors of their class (Königsberg and Nürnberg had been sunk, without any seaplanes aboard, while far from home), the two ships had been present at Jutland but their 105mm main armament was considered too light for fleet conditions. Stuttgart had gone into a lengthy refit afterwards while Stettin became a training target for U-boats; both were considered expendable. Stuttgart was still in dockyard hands at Wilhelmshaven’s Imperial Yards, as her post-Jutland work had very low priority, and so would be the first converted. The engineers hoped to incorporate any lessons learned in Stettin’s conversion, and so she did not enter the dockyard at that time (and apparently never did, although her exact state at war’s end is unclear). Workers removed six of her ten 105mm guns, and built a framework of steel girders over the aft deck to serve as a hangar. Canvas sheeting covered the frame, and two cranes for handling her aircraft were fitted as well. She carried three seaplanes, one of them on the open deck, and was declared ready for action in May. As flagship of the High Seas Fleet’s Aerial Forces she supported the mine warfare forces in the coastal zone but did not participate in the fleet’s last sortie in April 1918. In bad weather, Stuttgart could only operate two seaplanes, and when Adm. Franz Hipper assumed command of the High Seas Fleet in August 1918 he asked that a larger cruiser be converted, one that could operate more aircraft and do so in heavier seas. Hipper suggested the armored cruiser Roon, then employed as a cadet training ship in the Baltic. The navy’s engineers drew up a plan for her to carry eight to 10 seaplanes, and Kiel’s Imperial Yard was ordered to perform the conversion. She had been disarmed in 1916; in her new form she would carry six 150mm guns and six more 88mm anti-aircraft guns. An aft hangar similar to Stuttgart’s would be fitted, with four cranes rather than two. She could still make 21 knots, or so the staff believed, making her quite capable of keeping up with the fleet’s dreadnoughts; however, some of the plans indicate she could only handle four aircraft in her hangar, well short of Hipper’s requirement (this may result from confusion over the number of handling stations rather than the number of aircraft). The cadets were booted off the cruiser in September and the yard ordered to clear dockyard space and assemble materials and workers. But in October the project was cancelled, before any actual work had been performed. Stuttgart and Stettin became a British prizes after the war, and were scrapped in the early 1920s. Roon was scrapped at Kiel, where she had been moored awaiting conversion. All three cruisers appear in Jutland both in their earlier guise as gun-armed cruisers, and in their converted or projected appearance as seaplane carriers. 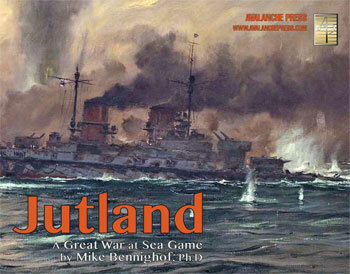 Click here to order Jutland!